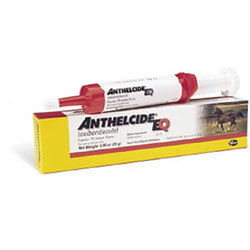 ANTHELCIDE® EQ Paste is a broad-spectrum equine dewormer containing the active ingredient oxibendazole. The paste formulation, packaged in easy-to-use, dial-type syringes, provides a convenient method of administration. Removal and control of large strongyles (Strongylus edentatus, S. equinus, S. vulgaris); small strongyles (species of the genera Cylicostephanus, Cylicocyclus, Cyathostomum, Triodontophorus, Cylicodontophorus, and Gyalocephalus); large roundworms (Parascaris equorum); pinworms (Oxyuris equi), including various larval stages and threadworms (Strongyloides westeri). Each syringe contains 0.85 oz (24 g) of paste.